Ria Loves Pawlish: Vaseline Spray & Go $2.00 Off Coupon! 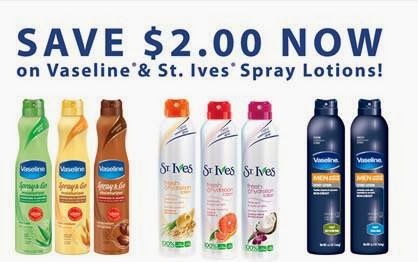 Vaseline Spray & Go $2.00 Off Coupon! the water was turned off again for a bit today... but thankfully for not nearly as long as yesterday! not sure how tomorrows going to go... it's lesson day, but the forecast is calling for loads of rain, so we'll see. if i don't ride, i will probably end up running errands... plus there are a few things i'd like to get from Ulta since i'm getting double points during my birthday month! today i'd like to share a coupon with you all from Vaseline! a pr rep shared it with me, and i just had to share with you all as it's for a product i love, Vaseline Spray & Go (and other spray lotions from Vaseline and St. Ives!). i thought i'd done a post on it, but i guess not... i will do one soon :) Spray & Go is a moisturizer in aerosol form, i love it madly because it's not nearly as greasy as traditional moisturizer AND it's so easy to put on! first, go to this link on Facebook and click on 'Click here to receive your $2.00 off coupon!'. a prompt to print should then come up! second, if you are not into Facebook, you can use this link for Coupons.com. just scroll down and the coupon should be one of the first ones! if you've never used Coupons.com before, all you need to do is click on 'clip' and then you'll be able to print it from the 'Print Coupons' tab!